Christopher Healy: Chronicler of Heroic Shenanigans | Chappaqua Children’s Book Festival! 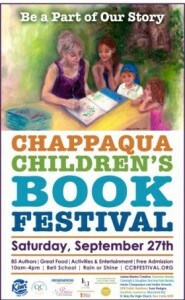 Tomorrow, Saturday, Sept. 27th, I’ll be greeting readers and signing books at the Chappaqua Children’s Book Festival in Chappaqua, New York (a good place to have the festival, considering its name). Click the poster below to check out the festival website, get details on time and place, and see the full list of over 80 authors in attendance.